What is it about apple orchards that make them so dream-like? Walking among the trees, with the sweet scent of fruit, and the light breeze dancing in-and-out among the leaves. There’s something about plucking the colorful orbs from the low hanging branches. Knowing that it’s there to sustain you and knowing exactly where it came from. Apple picking is a full sensory experience and now that the season is changing it only make me wish for fall even more. Summer and I have said our goodbyes, with the annual “freezer cleanse.” All the frozen berries, that were picked over the summer months, are pulled from the freezer and a baking/pastry/jam extravaganza takes place. It’s one last hurrah before fall and a way to relive all the memories of the past several months. Food memories are the best. 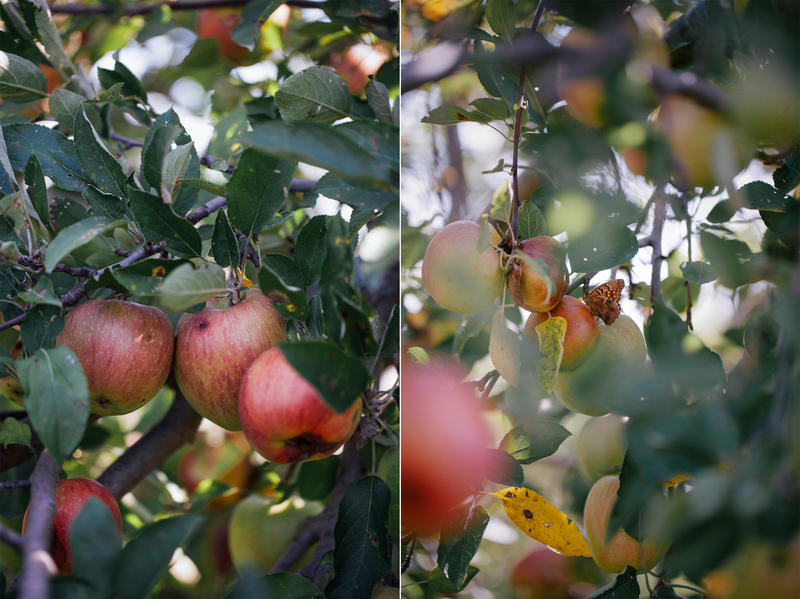 Recently, I was able to find the time to visit a local apple orchard just outside of Kansas City. One of the greatest parts of living here is that there is large variety of farms, orchards, and vineyards to choose from. Agricultural Midwest at its finest. After driving away from the orchard, with two large bags full of juicy apples, it felt as though the only appropriate way to ring in the changing season was to make fritters. What’s more indulgent than fried dough? Maybe fried dough that’s been dipped in a buttery, sugary, and milky glaze. Frying is something that I rarely do, so this was going to be special. 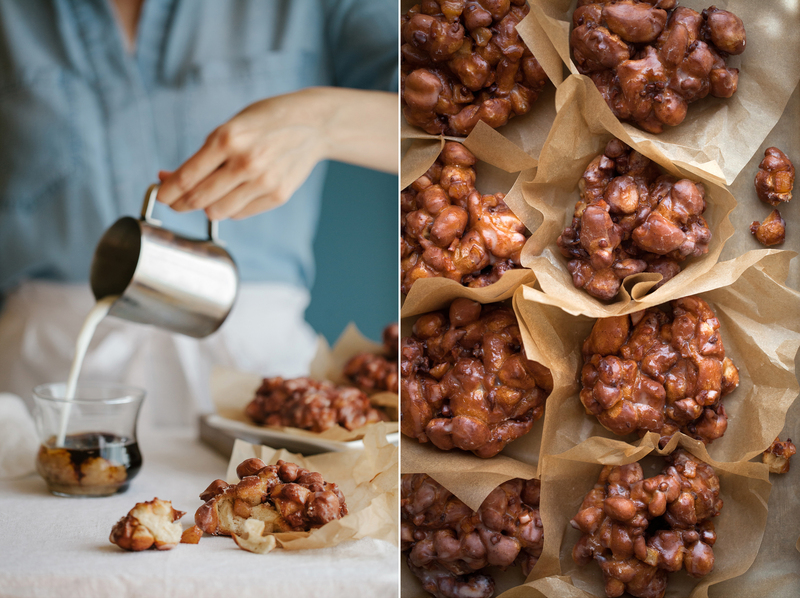 To make these Apple Pecan Fritters with Brown Butter Glaze would also take some planning. 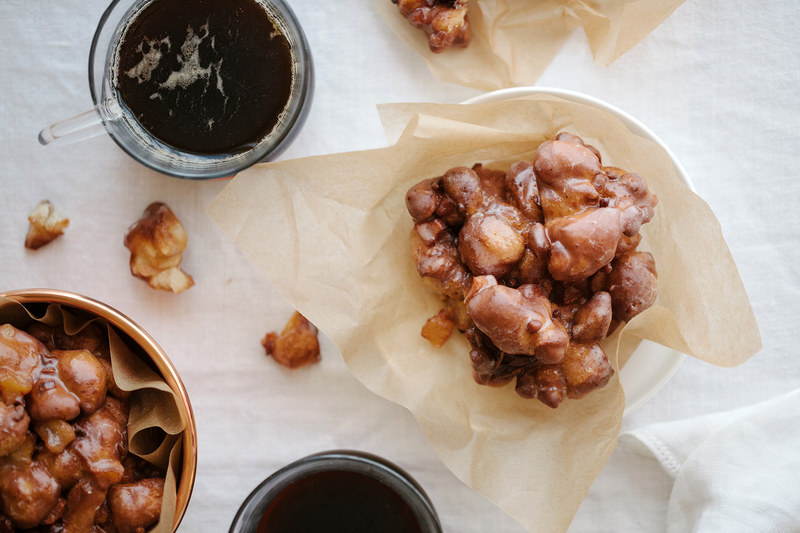 This light and fluffy fritter dough is made with yeast. Yeasted doughs take a little extra time to make, due to the two rises. One rise after you mix the dough (fermentation) and one after you shape the fritters (proofing). It’s always well worth the effort though and the reward is sweet. In order to keep it more convenient I made the dough the night before, allowed to rest in the fridge overnight, and then rolled it out the next morning. Minimal planning that results in a fluffy cinnamon-apple-pecan rich dough. 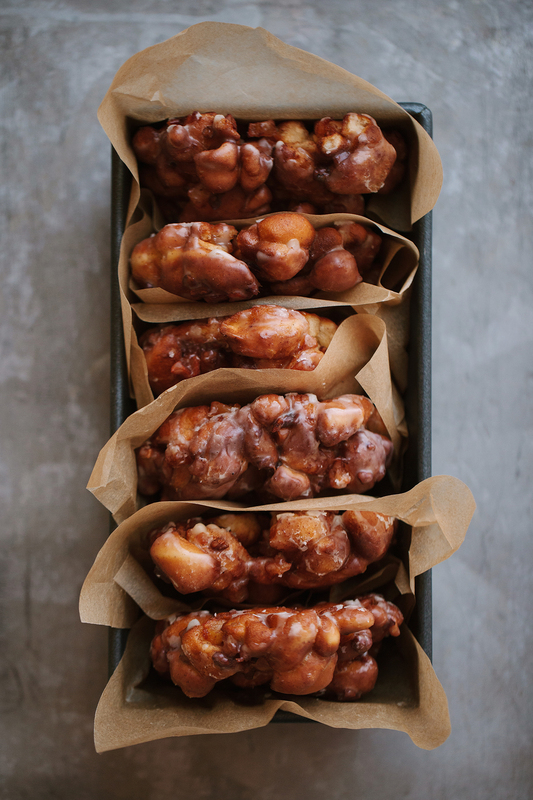 There is nothing like eating a still warm apple fritter with a hot cup of really good coffee. Biting into those apple chunks reminds me of the orchard and the joy that was experienced in those trees. Like I said, food memories are the best. In a stand mixer bowl, whisk together the yeast and water. Let rest for 5 minutes to activate the yeast. Meanwhile, in a small bowl, combine sugar, flour, baking powder, cinnamon, and salt. Add soft butter, vanilla, and egg to yeast mixture, then add the dry ingredients. Using the dough hook attachment, on low speed, mix dough until it forms a soft ball and pulls away cleanly from the sides and bottom of bowl. If needed, add an extra 1 Tbsp of flour to bring dough together if it’s too soft. Increase to medium speed and mix dough for 8-10 minutes. Final dough should be smooth and slightly tacky, but not sticky. While the dough rises, prepare the apple pecan filling and brown butter glaze (recipes below). Roll out dough into an 11” x 11” square (about ½” thick), on a lightly floured surface. Spread the cooled apple mixture onto half of the dough, then fold the other half of dough over the apples. Press down the dough edges lightly to seal. Using a bench scraper, or a large knife, cut the dough into 1/2-inch strips vertically and then repeat the same process horizontally across the dough (creating a checkerboard pattern). Lightly scoop up the pieces and rearrange, with the bench scraper, and repeat the process. Apples should be well dispersed throughout small pieces of dough. With floured hands, form the dough into a 12” x 4” log shape. Generously sprinkle the surface of the log with flour and cut into 10 pieces, around 1” thick. Scoop up and shape each piece into a small mound with floured hands. Be sure the dough and apples sticks together or it will fall apart while frying. Arrange dough mounds on a parchment lined baking sheet. Cover lightly with plastic wrap and let rise for 45 minutes to 1 hour or until doubled in size. Fill a large heavy-bottomed pot with at least 2 inches of oil (the oil should not come more than halfway up the pan) or prepare a deep fryer with its recommended amount of oil. Heat over medium-high heat until a thermometer registers 340°F. Using a spatula, carefully and gently lower one or two fritters into the oil. Don’t crowd them. Fry fritters for 1-2 minutes (deeply golden) and then gently flip over to cook for another 1-2 minutes. Remove from oil and transfer fritters to a cooling rack, set over a baking sheet, and let cool slightly. While still warm, dip the entire rounded side of each fritter into the glaze. Flip back over and allow to finish cooling on rack. If you like a thick coating, dip the fritter a second time into the glaze after the first coating has cooled. In a large sauté pan, over medium-high heat, melt the butter. Add in the apples, sugar, lemon juice, cinnamon, ginger, and salt. Cook apples, stirring occasionally, until soft and most of the liquid has evaporated from pan. Remove from heat and stir in toasted pecans. Transfer apple mixture to a clean baking pan, spread into a single layer, and rest on a cooling rack until completely cool. 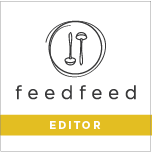 *To make brown butter: In a small pot, over medium-high heat, melt 3 Tbsp of unsalted butter. Occasionally swirl the pan to distribute the browning butter. Cook until the bits at the bottom of the pan begin to turn deep golden brown and the aroma is slightly nutty. Immediately, remove from heat and pour into a clean bowl (keep the brown bits at the bottom- that’s all the flavor). In a medium-sized bowl, whisk together all the ingredients. Glaze should be slightly runny, but still thick enough to coat. Add more warm milk if it needs thinning. *Just a friendly reminder that you can now follow my blog with Bloglovin. Hello, Jenny! That’s so generous and kind of you. Thank you very much for choosing to share this with your Facebook community. It sounds like a great group. Thank you for stopping by and for the support! Hi Becca! Thank you for your kind words. Fritters are a favorite of mine as well. All that fluffy goodness as you pull them apart. Happy to know that you’re planning on trying them out & hopefully they’ll make your weekend extra special. Have a great day! First of all your blog is stunning, Teresa – a true feast for the eyes! I made these fritters using pears and walnuts, as I didn’t have apples or pecans on hand. They turned out fabulous – an absolute crowd-pleaser. I can’t wait to try out more of your recipes! Hi Christine! Thank you so much for stopping by to share that you enjoyed the fritters. I love knowing that someone created a pastry from Now, Forager and that it brought them joy. Pear and walnuts sound amazing! So good in fact that I think I’m going to have to try it out for myself next time. All the best to you this new year, Christine! This recipe sounds delicious, but I’m a novice baker and can’t fully follow the middle part of the recipe. Do you have any photos of the process?